Fans will love the detail on this medieval style sword. 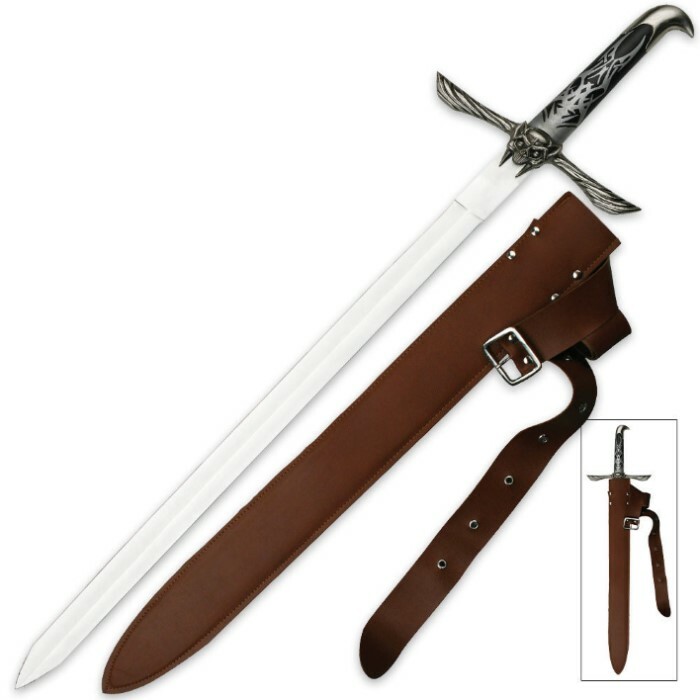 Inspired by Altair's favorite close range weapon, this sword features a double edged 440 Stainless Steel blade, hard wood handle, and cast metal guard and fittings. The winged skull is one of the most terrifying guards we have ever seen! The tribal artwork on the handle, followed by the clawed pommel complete this work of art. For those times when you need this trusty sword by your side, we include a stunning belt sheath, designed specifically for this sword. 31 in. overall, 24 3/4 in. blade, 6 in. handle. The sheath is a tad bit thinner than I would like but not that bad. The blade itself isn't super sharp for cutting but it holds together like a champ. The thrust is the only advantage I've had. The handle fit my hand nicely but I don't appreciate what seems like painted on grip marks. The handle is cheap plastic but the blade looks fantastic, has a nice weight to it. The pommel and the guard are metal so it is still definitely worth the price. Is there any way you guys could find a company to make other weapons from all the assassin creed games as well as having them be combat ready? Response: We can try! Thank you! I love Assassin's Creed and I just got this sword for Christmas and I have to say this blade is a beauty the only thing I can find wrong with it is the weight and thickness of the blade would not suggest using it for fighting, other than that I love it. The sword is great, I got very few complaints. My only two is that it's not as accurate as the in game model (but at the same time it looks better so that's not that big of deal) my other complaint, which is now my fault for not taking quick action, is that the sheath did not arrive with the sword. While not a big deal since I've read that the sheath isn't that great, I still would have loved to receive it. But over all 4/5 Sword is great for the price highly recommended for Assassin's Creed fans. The scabbard on is another thing all together it would have been better if the color of it matched the blade so instead of brown leather a silver black mixture would have been a better choice and some more design tweaks for it but for the price you pay for the blade makes the scabbard more of a protective case then an accessory. The scabbard i will have to give a 2 out of 5...sorry guys although i am looking forward to more assassin's creed products perhaps the sultans knife since i have not seen anyone else offering it. Just recieved this sword on Tuesday, and must say, oh my god! This sword is beautiful! Whether you're an Assassin's Creed fan (Like myself) or just like really unique, cool looking Longswords, I'd definitely recommend this, there are no flaws that I could fine on it at all. The sheath is nothing special, but it protects the sword, and that's its job, so it's great too. All in all, phenomenal product, my favorite weapon I have bought from Trueswords yet! I will definitely be doing business with them again very soon!